Every year five million people visit the Grand Canyon, and — believe it or not — most of those visitors view the amazing scenery through their car’s windshield while parked at an overlook! But that wasn’t enough for me. 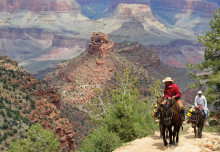 So several years ago my husband, Doug, and I booked a guided mule ride from the Bright Angel Lodge on the south rim, where we would ride down into the canyon, eat lunch, and ride back up again. It was a seven hour trip covering twelve miles in total, which sounds easy, doesn’t it?! 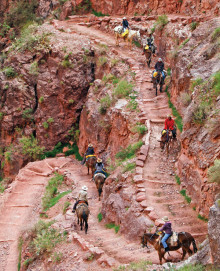 Guide leading mule riders up a steep portion of the Bright Angel Trail known as Heartbreak Hill. The Battleship formation is in the background; Cheops Pyramid is beyond that. Doug was then boosted onto the back of a large brown molly mule named Zug Zug. As the smallest rider I was assigned See-More, the smallest mule. (All riders must weigh less than 200 lbs.) Each of us was passed a “mule motivator”, a short riding crop, and then we were on our way. The path down the south rim of the Grand Canyon is about four feet wide, steep and very rough, but it was soon obvious that our mules were sure-footed and relaxed. Our guide, a Native American named Abendego, rode at the front of the line, with a second guide following at the end. We rode for two hours, dropping 954 metres until we came to our first stop at Indian Gardens. 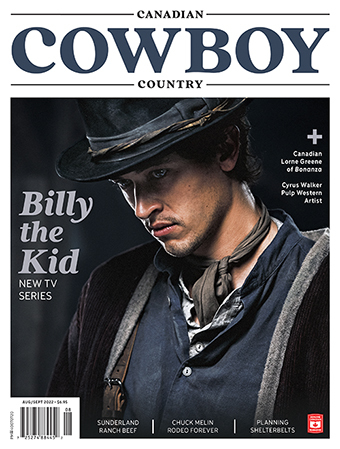 “Now I know why cowboys are bowlegged,” Doug whimpered as he hobbled off to the compost bathrooms. My aching knees agreed. After a short break we remounted, and rode several more miles to Plateau Point, which overlooked the Colorado River hundreds of feet below. Here we ate our box lunches while admiring the rare California Condors perched nearby. We also saw mule deer, roadrunners, bighorn sheep and those cute but dangerous ground squirrels! Cacti were everywhere. Our November temperature was lovely — it was 10ºC at the top and 26ºC at the bottom — but we learned it could get over 44ºC in the summer, which explained the cacti. Hermit Road on the South Rim of Grand Canyon National Park offers a spectacular view of the Bright Angel Trail switchbacking through the canyon below. I was amazed by the number of people who had hiked into the canyon. People of all ages, obviously in better condition than me, hiked with backpacks brimming with tents and sleeping bags, with plans to stay overnight at Indian Gardens, or at the Phantom Ranch farther below. As we rode back up the canyon our guide pointed out various rock formations, Indian petroglyphs and crude helicopter pads. Yes, helicopter pads — three to four emergency trips are made each week, with heat stroke and exhaustion being the most common ailments. But while the beauty of the Grand Canyon filled me with awe, the ability of See-More filled me with equal appreciation. Those mules were careful and confident as they stepped over rocks and logs, and their abilities at Jacob’s Ladder, a steep area with hand-carved steps, was amazing! We did occasionally have to use our “mule motivators” on the trip back up, but none of the mules seemed winded, while I would have collapsed under my own power! The Grand Canyon is incredible — and so are their mules. Make the time to ride into the canyon yourself one day.